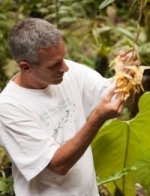 Dr. Joe Meisel is vice president of the Ceiba Foundation for Tropical Conservation, and has worked for over 20 years in Latin America conducting research, teaching, and working with local landowners and communities to protect orchid habitat. Dr. Ron Kaufmann is a professor at the University of San Diego, a long-time orchid grower, founding member of the Orchid Conservation Alliance and chair of the San Diego County Orchid Society's Conservation Committee. Dr. Franco Pupulin is the orchid curator of the Lankester Botanical Garden in Costa Rica, editor-in-chief of Lankesteriana, and frequent contributor to scientific journals on the subject of orchid taxonomy. Description: Hefty Acineta plants favor thick, strong branches from which characteristic waxy, rounded, bell-shaped flowers hang in loose bunches. Flower: Spherical blossoms appear only partially open: thick sepals enclose smaller petals in a shape reminiscent of a sleigh bell. Typically yellow or cream-colored, flowers almost always are decorated with wine-colored spots. Side lobes of the fleshy lip sweep upward around the column, while the cupped front portion nearly closes the orb-like chamber. The lip is rigid, to which the genus owes its name (Greek for non-kinetic or immobile). The thick, waxy column often is hairy near the base. Most species are fragrant. Plant: Bulky (3-4” tall), egg-shaped pseudobulbs are deeply grooved, with 2-4 large, pleated leaves emerging from the top. Numerous flowers on a single, unbranched spike (to 20” long) dangle beneath the plant. Similar: Anguloa is terrestrial, with one or two flowers on an erect inflorescence. Gongora plants are much smaller, the flower sporting a highly complex, extended lip. Peristeria pseudobulbs are smooth (when young). Stanhopea pseudobulbs are squat, inflorescence stalk is narrow (usually pencil thin or smaller), and flowers are not cupped. Diversity and Distribution: Some 15 species of Acineta grow epiphytically in middle to high-altitude wet forests, from southern Mexico to Peru. Ecology & History: Acineta flowers are pollinated by medium to large-bodied male euglossine bees that crawl into the space beneath the column, where they scratch the lip surface to collect fragrance; they utilize the scents in complex mating rituals (see Paphinia). Upon backing out, they trigger the release of pollinia which are glued to their back. A large hump on the lip forces the bee to scrape its back against the column, like stepping over a suitcase in a stairwell. The bees collect odor substances with their front legs, then back out and hover while transferring the scent to storage areas on the hind legs, then re-enter the flower and start again. 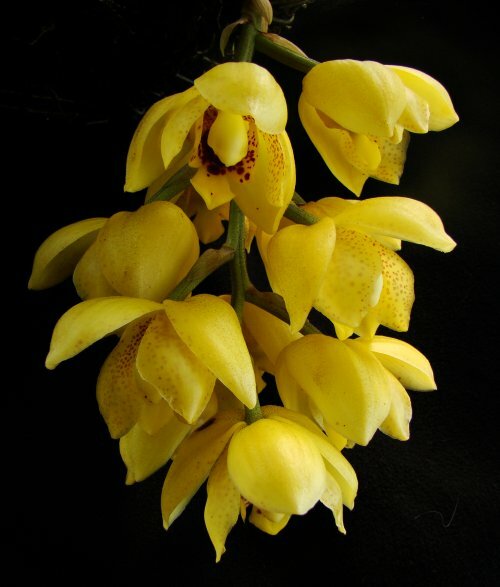 It is thought that a distinct blend of fragrance chemicals is produced by each Acineta species: the unique odor attracts only a single type of pollinator, thus ensuring the bee will exclusively visit flowers of that species..
Why are orchids so diverse? Threats and conservation: what is being done to save orchids? For more information, please contact the author. To order, visit Powell's Books, Amazon, Cornell University Press, or local booksellers (find a bookstore).